I’m very blessed to have basked in the beauty of some of the most stunning corners of the world. A recent trip to Tobago re-opened my eyes to the wonders this planet has to offer. With the help of a pair of sunglasses (admittedly not my own), in an instant I saw nature in a very different light. It was as if I’d literally donned a pair of rose-tinted glasses, and all of a sudden I could smell the coffee beans. I’ve been experimenting with energy for a few months, channeling it, manipulating it, ejecting the bad stuff, absorbing the good, and generally being aware of the intricate vibrations of everything at a nerd-satisfying level of atomicity. Interestingly I found the more I analysed, examined and defined the intricate details of mother nature’s artistic displays, the easier it was for me to see the bigger picture. And, by seeing the world in panoramic view, it all suddenly felt closer to me… almost tangible, like if I reached above my head I’d be able to feel the clouds against my finger tips… it almost could have been a 70’s inspired acid trip if it wasn’t so completely natural, authentic, and REAL. All the colours became brighter, more vivid, my sense of smell and sight increased, I could see patterns on palm tree leaves I’d never noticed before, and the sand below my feet became even more present… does that even make sense? Through appreciating nature at a vibrational level, I gained an increased sense of awareness. It was honestly one of the most beautiful and intoxicating experiences I’ve ever had in my life. I’m not doing it justice by trying to articulate it with something as simple and restrictive as the English language, but it’s something I have to share. 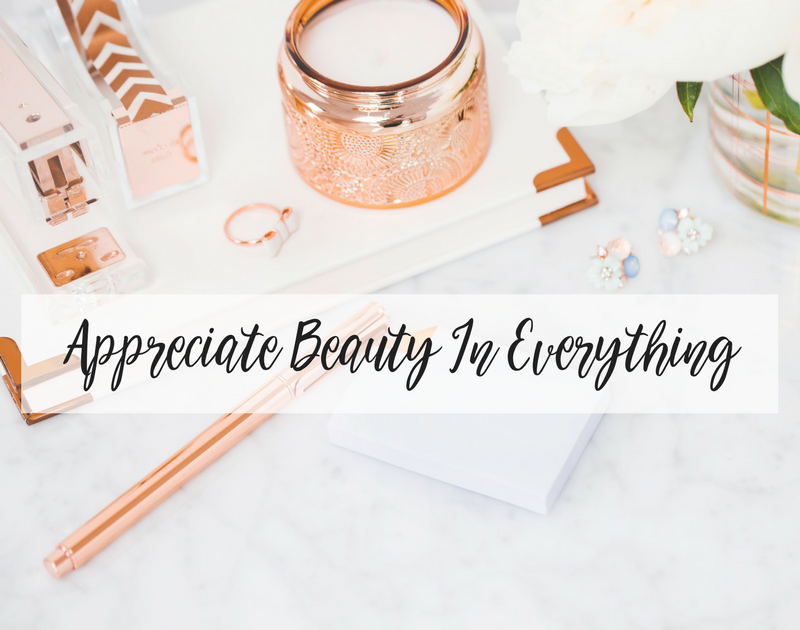 When I realised appreciation was the key, I tried to apply it to other areas of my life, not just mother nature and her fabulousness, but other people, situations and opportunities, to see if the heightened sense of awareness would transpire. It did. See nothing ever arrives into our lives unless we desire it so. In desiring something, we welcome the full force of whatever ‘it’ may be, be that consciously, sub-consciously, or even unconsciously!! The Universe is energy, connecting every one to every thing, so when we vibrate at a certain level, we will attract other people, events, and ‘things’, to ourselves, that are of the same vibrational frequency. We ask for these circumstances whether we realise it or not. Those of us who practice the art of attraction, or the ‘law of attraction’ as it’s more famously known, will consciously make the effort to emit frequencies in order to manifest the desired result into our lives. Belief is a huge factor in ensuring these vibrations are produced and released effectively. However, in order to completely manifest the life of our dreams, we also need to be practiced in the ‘art of allowing’, i.e. allowing the return vibration IN to our lives with acceptance and appreciation, even when (and here’s the crux), you receive something/someone/an outcome, that you didn’t expect and perhaps don’t want. This is where my appreciation and heightened sense of awareness discovery kicks in. It’s the final piece in the puzzle to manifesting the life of your dreams. If we can openly accept and genuinely APPRECIATE every arrival into our lives, the ‘heightened sense of awareness’ that follows, is guaranteed to help us see something we might not have noticed if our eyes were still closed. Remember nothing is ever as it first may seem. Sometimes we’re required to look a little deeper… scrutinise at the most intricate vibrational level in order to realise why we’ve attracted this particular result into our lives and how it can serve us, because I can absolutely 100% guarantee we are never sent anything we didn’t ask for. It’s Universal Law. What have you rejected recently? Is it worth taking another look? Does this not scream materialistic, tunnel vision, desperation hell?! Sorry to be blunt. LOOK AT THE BIGGER PICTURE. Get panoramic! Walk outside and immerse yourself in nature. London’s not the best spot for it admittedly but we have some great parks. Lie on the grass and don’t leave until the colours around you light up your life. Then you’ll know what I’m preaching about. The Universe is EVERYTHING and she seriously rocks.